For many centuries the studio concept has been intimately linked to architectural education, being considered the "heart" of the discipline抯 education. It was the preferred model when architectural education was first accepted into higher education across the western world, including in Australia and New Zealand, where since its introduction it has been adapting in response to context. In recent years the landscape of higher education in Australia and New Zealand has been undergoing significant changes due to global trends of massification, which have led to the decline in resources, insufficient space and increasing student enrolments. It is in this landscape that architecture academics, in 2007, reported concerns for the studio抯 future despite its prominent position and enduring legacy in architectural education. However, confusion ensues, as different studio forms make it difficult to define. Therefore, the aim of the study is to understand how the studio concept and forms are responding to the changing higher education landscape in Australia and New Zealand over the period of 2007 to 2011. 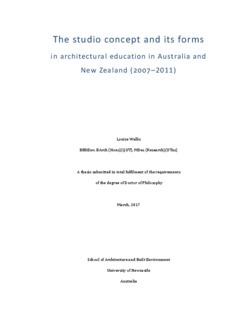 For the purpose of reaching the defined aim of this study, a review of literature relating to both current and past studio meanings in architectural education was conducted, also other disciplines were considered in the review for the purpose of establishing the impact of the higher education landscape being experienced in Australia and New Zealand. Also, the mapping of literature documents the extent of the studio concept and its forms according to place, culture, teaching approach and curriculum. Many concerns relating to the effectiveness and suitability of studio places, studio culture and past instruction methods are documented, which indicate the need for an evidence-based scholarship in the changing climate. It is clear that a knowledge gap exists in how the term studio is conceptualised and the studio models present. This dissertation explores these knowledge gaps and potential implications for the architecture studio抯 future in Australia and New Zealand. A mixed method approach was employed in this study, largely based on qualitative inquiry with a purposeful sample group of six schools and 10 academics, and embedded with quantitative data. The group of study participants reflects the maximum variations from a secondary analysis of Ostwald and Williams抯 studio (2007a & b) and Australasian school data (AIA, 2008b). Multiple methods were used to understand the studio form in which each academic involved in the study was employed, including a series of interviews relating to a recent design unit they taught, as well as the analysis of the unit outline and supporting materials. These approaches were supported by an observation of the teaching facilities in which the academic participant worked. Biggs抯 (2003) framework of constructive alignment system for quality learning and teaching was used to analyse the schools� studio forms and implications. Four studio models have been developed from the analysis for the purpose of defining the studio diversity and relationship between the curriculum structure, teaching methods, environment and assessment which exist in the teaching of studio. It is clear that academics understand the studio concept holistically but also in a pluralistic way as the term is used interchangeably to denote design teaching, design unit and the physical place, despite the absence of established traditions such as studio places. This dissertation contributes new insight into how the diversity of studio models, largely driven by the institutional climate, are creating a considerable divide between schools in Australia and New Zealand which may, in turn, lead to a distinct two-tier system. Another significant outcome from the study was the development of a typology of studio models to support debate about studio forms in practice.